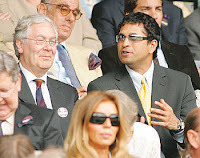 Our master, Sachin Tendulkar was a guest in the Royal Box yesterday at Wimbledon 2009 , London. No doubt he would have appreciated and enjoyed the high voltage drama of the men’s final between Roger federer and Andy roddick, but Sachin Tendulkar may have also been starstruck before the match began. His boyhood hero was legendary star John McEnroe, and ‘Supermac’ was out on court before the players arrived, teeing up the match for the BBC television audience. As a youngster, Tendulkar would copy McEnroe’s style, wearing wristbands and headbands, and played plenty of tennis until cricket began to dominate his life in the mid-1980s. I had gone at SGPGI LUCKNOW,AIMS AND REGENCY IN KANPUR for her treatment,all docters said without opretion she can't hear. For opretion they chargs near about 6.5 laks.I have not this money. I request to you for my child for donation . Please help my child. If you want to help us self or another way. My full addres is CK.63/95 CHOTI PIYARY VARANASI.